Wilhelm Reich invented the orgone accumulator, a device that accumulated life force from its surroundings. Now You Can work with the creative energies of the universe !!! For those who know, Rune Radionics™ is the ultimate radionics experience! The reason why Radionics works! The Rune Master Radionics Program: the motor of Your Success!!! 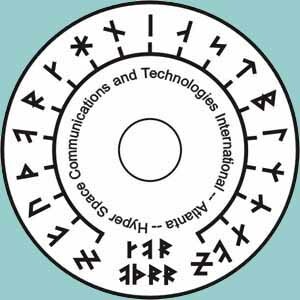 Rune Radionics™ is Super Radionics™ that is rooted in the numerical system with the base 18: The 18 Runes of the Armanen Futhork. We showed in our Basic Rune Course and elsewhere that the 18 Runes of the Armanen Futhork correspond to the basis-number of the periodic system, to the natural zodiac of Runes, the the Runic scale of 18 tones in the octave, and to many other natural constants that are rooted in the creative structures of the universe. Therefore, Rune Radionics™ is gigantic steps ahead of all traditional radionics devices and run-off-the-mill radionics programs! 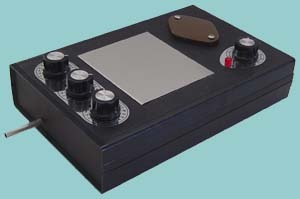 The Rune Master Radionics Programs™ are connected with such a Chi Generator®: either with an orgone generator® per se or, better, with a Rune Radionics™ device with its built-in Chi Generator®. This additional massive life force means continuous power driving towards the results that you program into your Rune Radionics™ Device and/or into your Rune Radionics™ Program!!! 1. The settings of the tuner are combinations of Runes. In other words, the numeric system used for the tuner is not the decimal system, but it is composed of the creative energies of the universe, represented in the octodecimal system (base 18) of the Futhork Runes. 2. The Rune Radionics™ Program and Rune Radionics™ Devices . 3. The Rune Radionics™ Program and Rune Radionics™ Devices have settings in addition to the "Main Trend" and "Main Target" settings, which amounts to a total of 6 stations plus an orgone energy transfer function. (1) a basic energy ("Basic Action") setting that boosts the trend-to-target connection with the principal energy field that favors the radionics operation, for instance you use Venus in work concerning relationships, Jupiter for business, Mercury for negotiations, studies and communications, etc. 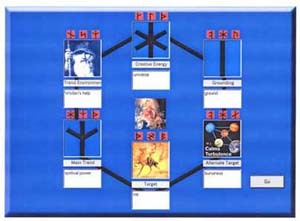 (5) a setting for an alternative target. You can also use this alternative target as a "grounding function". Using it this way, you can prevent repercussion to the operator in the event when the trend energy cannot reach the envisioned target for reason of interference, blockage, etc. (6) an orgone transfer function that you use to energize the Power Radionics Program by connecting it with a Welz Chi Generator or with a Power Radionics Device. The Rune Master Radionics Program's rates are set with the octodecimal numeric system (base 18) of the Armanen Futhork. This connects directly with the creative energies of the universe (CEU). The Rune Master Radionics Program™ comes with well over thousand ready-to-use filters for just about every purpose you can imagine and you can also use your own easily created filters or images. Naturally, this means ultimate flexibility, adaptability and independently acting creative powers for maximum effectiveness and performance to achieve any outcome that you desire. This extremely powerful generator of creative Od is fashioned after the Rune Master Radionics Program. It boasts six generators of life force (Od), each output pipe being silver. The six rows of three dials for each of the 6 generators of Od (life force, chi energy) are six Rune Radionic tuners that you can set in tune with the Rune Master Radionics Program! Cosmic Creative Concepts at work !!! Naturally, all dials are based on the octodecimal numeric system (base 18) of the 18 Futhork Runes! This is a natural numeric system based on cosmic creative energies that, besides the creative energy system as symbolized by the Runes, appears as well in the structure of the periodic system of elements (the first five "periods" being 2 - 8 - 8 - 18 - 18), the natural zodiac of creative energies, the musical scale of 18 creative sounds as you find in the Rune Master Radionics Program and many others. Cosmic Creation Concepts exponentially boosted with massive Od! A Heavy Duty Od generator Rune Radionics™ combination device that works very well in conjunction with the Rune Master Radionics program. 3 Rune dials for the target of the operation, 3 Rune dials for the trend energy. 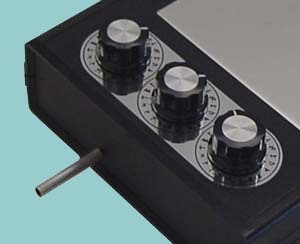 You can connect this powerful device to the sound output of the Rune Master Radionics program or use it by itself. Harness Cosmic Creative Energies with a Heavy Duty Od Generator! Middle of the Line Od Generator with one tuner featuring Rune dials. Use in conjunction with the Rune Master Radionics program or by itself. 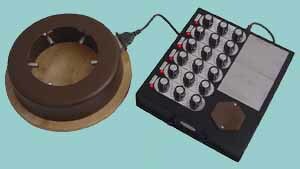 When using by itself, you can set the radionics dials for trend, target, or a combination of both. Rune Magic with a Middle of the Line Od Generator™! 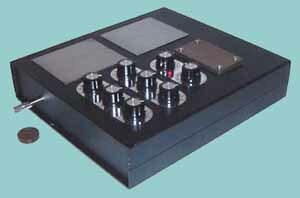 Like all Rune Radionics Devices, the Power Booster is made of the Super-Orgonite™ composite material for extra power. Effectively tripes the output of the "Hammer", doubles the output of the RAD 2000 RU and adds a lot more power to the RAD 2400 RU. The transfer disk allows smooth transfer of Od from the generator to you, any distance! Size: 1 3/3 in. diameter. Silver tubing varies depending on device for which you use it. 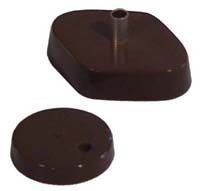 Size 1 (5/16" diameter) for the Hammer and RAD 2000 RU, size 2 (1/2" diameter) for the RAD 2400 RU. for smooth transfer of Od from the generator to you, no matter how far you are away, whether in the neighboring house or half around the globe.